A car that runs on air could soon be a reality for Indians. Tata Motors has signed an agreement with Moteur Development International of France to develop a car that runs on compressed air, thus making it very economical to run and be almost totally pollution free. Although there is no official word on when the car will be commercially manufactured for India, reports say that it will be sooner than later. The car -- MiniCAT -- could cost around Rs 350,000 in India and would have a range of around 300 km between refuels. The cost of a refill would be about Rs 90. The technology that MDI vehicles use is not really new. Compressed air technology allows for engines that are both non-polluting and economical. After ten years of research and development, MDI is prepared to introduce its clean vehicles onto the market. Unlike electric or hydrogen powered vehicles, MDI vehicles are not expensive and do not have a limited driving range. MDI cars are affordable and have a performance rate that stands up to current standards. To sum it up, they are non-expensive cars that do not pollute and are easy to get around cities in. Single energy compressed air engines. Dual energy compressed air plus fuel engines. The single energy engines will be available in both MiniCATs and CityCATs. These engines have been conceived for city use, where the maximum speed is 50 km/h and where MDI believes polluting will soon be prohibited. The duel energy engine, on the other hand, has been conceived as much for the city as the open road and will be available in all MDI vehicles. The engines will work exclusively with compressed air while it is running under 50 km/h in urban areas. But when the car is used outside urban areas at speeds over 50 km/h, the engines will switch to fuel mode. The engine will be able to use gasoline, gas oil, bio diesel, gas, liquidized gas, ecological fuel, alcohol, etc. Both engines will be available with 2, 4 and 6 cylinders, When the air tanks are empty the driver will be able to switch to fuel mode, thanks to the car's on board computer. MDI explains that 90m3 of compressed air is stored in fibre tanks. The engine is powered by compressed air, stored in a carbon-fiber tank at 30 MPa (4500 psi). The tank is made of carbon-fiber in order to reduce its weight. The engine has injection similar to normal engines, but uses special crankshafts and pistons, which remain at top dead center for about 70 degrees of the crankshaft's cycle; this allows more power to be developed in the engine. The expansion of this air pushes the pistons and creates movement. The atmospheric temperature is used to re-heat the engine and increase the road coverage. The air conditioning system makes use of the expelled cold air. Due to the absence of combustion and the fact there is no pollution, the oil change is only necessary every 50 000 km. The end product is a light weigh vehicle that can reach speeds up to 220 kmph. MDI's vehicle's have fibreglass bodies which makes them light, silent urban car. The car's body is tubular, light weight, and is held together using aerospace technology. The vehicles do not have normal speed gauges. Instead, they will have a small computer screen that shows the speed and engine revolutions. The system allows for infinite possibilities such as GSM telephone systems, GPS satellite tracking systems, programs for delivery people, emergency systems, internet connections, voice recognitions, map presentation, traffic information, etc. The seatbelt system is different from what we know. One part of the belt is anchored to the floor of the car, like traditional cars. The other part of the belt, in stead of being attached to the side of the car, is also anchored to the floor of the vehicle. This helps to secure the bodies of the driver and passengers in the case of a collision. The vehicle's electric system is also revolutionary. MDI has bought a patent that is bound to reduce the important of electrical systems in all cars. The trick consists in using a small radio signal. The system makes the car 20 kilos lighter and considerably quieter. There are no keys - just an access card that can be read by the car from your pocket. In the single energy mode MDI cars consume around Rs 45 every 100 km. When there is no combustion, there is no pollution. The vehicle's driving range is close to twice that of the most advanced electric cars (from 200 to 300 km or 8 hours of circulation). The recharging of the car will be done at gas stations, once the market is developed. To fill the tanks it will take about to 2 to 3 minutes at a price of Rs 90. After refilling the car will be ready to driver 200 kms. The car also has a small compressor that can be connected to an electrical network (220V or 380V) and will recharged the tanks completely in 3 or 4 hours. Because the engine does not burn any fuel the car's oil (a litre of vegetable) only needs to be changed every 50,000 km. The temperature of the clean air expulsed form the exhaust pipe is between 0 and 15 degrees below zero and can be subsequently channelled and used for air conditioning in the interior of the car. The smallest and most innovative: three seats, minimal dimensions with the boot of a saloon: a great challenge for such a small car which runs on compressed air. 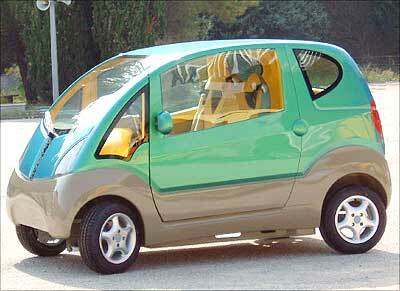 The MiniCAT is the city car of the future. Airbag, air conditioning, ABS, 3 seats, 1.5 m3. A spacious car with seats which can face different directions. The vehicle�s design is based on the needs of a typical family. Airbag, air conditioning, 6 seats. The MDI Group is headed by Guy Negre, a former Formula One engineer. MDI is a small, family-controlled company, founded in Luxembourg but now located at Carros, near Nice (southern France) where Guy and Cyril Negre, together with their technical team, have developed a new engine technology with the purpose of economising energy and respect severe ecological requirements -- at competitive costs. With inputs from MDI Web site.